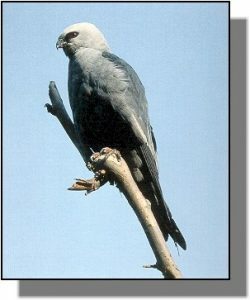 Distribution: Mississippi kites currently breed in the southern United States from central Arizona to the Atlantic Coast. Their breeding range in Kansas lies in the southwestern and south-central part of the state. Most kites winter in central South America. Food: Kites are skilled at capturing cicadas and grasshoppers on the fly. They will also capture large insects on the ground. Occasionally they will feed on small birds, rodents, frogs and snakes.